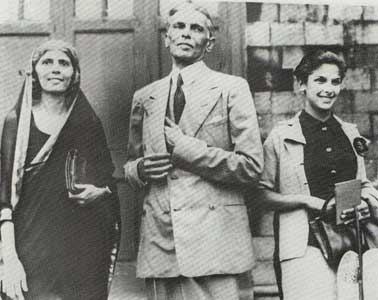 In the night between 14th and 15th of August, 1919 – shortly after midnight, Jinnah’s first born child was born. Oddly enough, his second off-spring, Pakistan, came into being exactly twenty-eight years after! Dina Jinnah, daughter to Jinnah and Ruttie was a dark-eyed beautiful child, with her mother’s smile and her father’s intelligence, Dina was the ‘sole comfort’ of a doting father. Here is wishing Dina a very happy 93rd Birthday, with love, all the way from Pakistan! For some odd reasons, I have always been intrigued by the two key women in Jinnah’s life – Ruttie and Dina. I wish I had the lucky opportunity to meet with Dina, and learn more about her father from her! The side of her father we only get to see in rare photographs – the happy Jinnah who would read H.C.Armstrong’s biography of Kemal Ataturk, Grey Wolf, to his daughter. The book was all he would talk about to Dina to the extent that she would lovingly call her father ‘Grey Wolf’. Dina did return to Pakistan – for the second time – in 2004. She visited her father’s mausoleum in Karachi and her remarks are a stark reminder to today’s Pakistan of how far we have come – “This has been very sad and wonderful for me. May his dream for Pakistan come true.” I wonder if she was echoing what Jinnah would perhaps say too, if you were to ask him for his comments on today’s Pakistan. Ruttie and Dina are the two missing links in our history – perhaps one day, I shall find the time and peace to write more in detail. Until then, here is wishing Grey Wolf‘s daughter a very very Happy Birthday! Okay this might sound stupid , but talking about Quaid e Azam always makes me emotional and yes I also find Ruttie and Dina very intriguing , always wonder what it would have been like if Ruttie was in Pakistan! loved the write up! as always ! I would love to meet her too. Please keep writing about her.